Lather, rinse and repeat as often as you like! 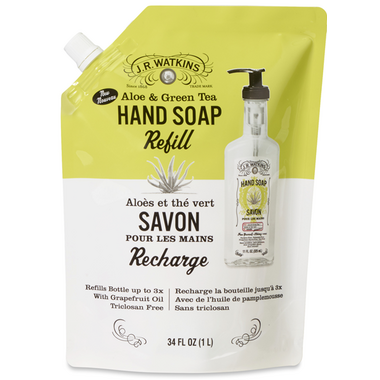 J.R. Watkins' Liquid Hand Soap Refill Pouches refill your 11 fl.oz. trial-mark bottle 3 times. This value sized, environmentally friendly pouch is filled with the same naturally gentle formula you know and trust. Your skin will always be fresh and clean. The clean, fresh scent of aloe and green tea refreshes your mood and helps you focus. It’s like strolling through a sunny meadow at the first sign of spring. Ingredients: Water/aqua/eau, sodium lauryl sulfate, cocamidopropyl betaine, sodium chloride, decyl glucoside, caprylyl/capryl glucoside, glycerin, tocopheryl acetate, Citrus grandis (grapefruit) peel oil, cocamidopropyl hydroxysultaine, myristamine oxide, methylisothiazolinone, sodium benzoate, gluconolactone, fragrance/parfum, citric acid. Love the smell and like this product for our washroom and kitchen.